With today’s crop of series oriented authors we now take such science fiction concepts for granted. Dazzling ideas and writing have almost become commonplace. What hasn’t become commonplace are thoughtful depictions of the conflicts between humans and the next stages of evolution as influenced by machines and technology. 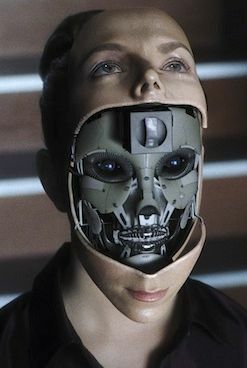 While there have been many robot-oriented movies and stories, the number that seriously explore successfully the conflicts raised by questions such as “what is human” and “what has a soul” is relatively small. It is therefore with great astonishment and pleasure that I saw Steven Spielberg’s “AI ARTIFICIAL INTELLIGENCE.” Not since Kubrick’s “2001” have I seen such complex and profound ideas dealt with in such a grand, intelligent, and state of the art manner. One could spend time on the details of this extraordinary production, which are reasonably well addressed in the numerous extras accompanying the movie on the 2-DVD set. What I responded to most strongly were the emotional sweep and grandeur of the story, its realistic depiction of the near future, and its audacious presentation of the far future, all tied together with young robot David’s search for his “mother” and his hoped-for humanity. We have Kubrick and Spielberg to thank for this, and Spielberg knows how to tie together adventure, technology, and emotion better than most directors. Standouts in my mind: Jude Law’s performance as Gigolo Joe, Haley Joel Osment’s young David (the kid is absolutely brilliant — just listen to him in the discussion with Gigolo Joe immediately after they meet Dr. Know), Stan Winston’s robots, the phenomenal integration of CGI and live action, Rouge City, future Manhattan, just for starters. John Williams’ musical score is a winner (though the soundtrack CD’s selection and ordering leaves much to be desired - this is definitely another example of where an isolated score on the DVD would have been a welcome addition). As with MOULIN ROUGE, ARTIFICIAL INTELLIGENCE seems to generate pretty strong feelings one way or another. I’ve heard people refer to it as “depressing,” even “distasteful.” Actually, what I find depressing is its less than stellar performance at the box office, not because Spielberg needs more money, but because it may cause other studios to shy away from financing such audacious (and potentially expensive) stories. That would be a shame, since AI in my mind is one of the best example of popular art to come along in a long time. Just one question - where is Spielberg’s signature shooting star? Having watched this movie repeatedly, I am now even more impressed with the ending and with the themes that are explored there. I’ve noticed that several reviewers have faulted the ending for a variety of reasons, among them its artificiality and its emotion. My take is different. I think the ending distills the key themes that Spielberg discusses in his little speech on the DVD where he says that we have to eventually face important issues raised by the increasing intelligence of the machines we develop. What the ending does for me is emphasize the “human-ness” of the robots, which (if we take at face value the movie’s main story about the creation of David) is based on their having evolved from machines developed by humans. The tenderness with which David is treated by the advanced robots, and the interaction initiated through the Blue Fairy simulacrum, remind me of the line describing androids from BLADE RUNNER: “…more human than human.” Only in this case, the robots have been programmed only with the “best” of what humans have to offer. Yes, the ending does manipulate us in Spielbergian fashion. We sympathize with David for his being alone. But he is not human, so why does this still touch us? And we cringe at his one day with Monica, knowing that she MUST die. But she is as artificial as David, created from “… a hank of hair.” After all, watching a boy watch his mother die is painful, isn’t it? Yes it is, and that is Spielberg’s intention. He makes us care about these artificial creations, just as if they were real people. And that, I think, is the real point of this movie.